(9151): 6"H x 6'L (1,829 mm x 152 mm) 10 lbs. (4.5 kg). Each for $82.00. (9158): 6"H x 9'L (2,743 mm x 152 mm) 13 lbs. (6 kg). Each for $ 120.00. (9154): 6"H x 12'L (3,658 mm x 152 mm) 16 lbs. lbs. (7 kg). Each for $162.00. (9159): 6"H x 15'L (4,572 mm x 152 mm) 20 lbs. (9 kg). Each for $203.00. (9148): Counterweight* 14"L x 1 1/2" dia. (356 mm x 38 mm dia.) 7 lbs. (3 kg). Each for $15.00. * One counterweight pouch for 6' Gutter Guard Plus. All other sizes have two pouches. 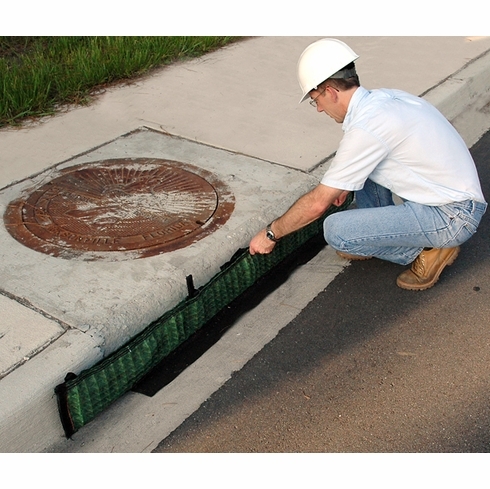 •Designed for curb inlets with high-flow volumes. •Unique, multi-dimensional outer filter combined with rigid inner frame maintains a low profile to prevent damage from vehicular traffic. •Modular, 3-foot, inner frames allow for compact transport and storage. •Tie-back straps on either end of unit can be used with sod pin or stake for additional anchoring. •Can be easily cleaned and reused. •Helps comply with NPDES, 40 CFR 122.26 (1999). •Sizing note: When ordering allow 12" overlap on each side of curb inlet.